Contact us about HTMA and OligoScan and OligoLab testing. The OligoScan and OligoLab provide a state of the art testing device that uses skin testing via the palm to determine 20 minerals, 14 heavy metals and 4 essential mineral ratios. This device identifies the amount of heavy metals actually hiding inside the cells using spectophotometry. The OligoScan and OligoLab technology utilizes spectrophotometry to obtain results on the amount of trace elements and heavy metals exist within tissue, calibrated specifically for a specific area of the body. This is a quantitative analytical methodology, which consists in measuring the absorbance level or the optical density of a specific chemical or mineral substance. The basic principle is that every type of compound, regardless if it is chemical or mineral based, absorbs, emits or reflects light (electromagnetic radiation) over a certain specific range of wavelengths. The more the sample is concentrated, the more it absorbs the light within the limits of proportionality expressed in the law Beer-Lambert. Propagating a beam of light through a diffraction grating works like a prism and separates the light into different wavelengths. The grating is constructed in that only specific wavelengths reach each exist site located on the grating framework. 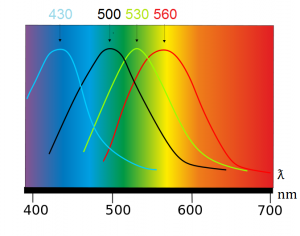 The wavelengths of light interact with the sample, and a detector within the portable spectrophotometer device measures the transmittance and absorbance of the sample. Transmittance refers to the amount of light that will completely pass through the sample and absorbance refers to the amount of light absorbed by the sample. This information is then collated into a digital report (Gaston College, 2017). The OligoScan is specifically measuring heavy metals found intracellularly. It does not measure heavy metal levels in deeper tissues, such as adipose and bone. Circulating heavy metals are highly toxic to the body, so the body tends to sequester and store heavy metals, such as cadmium, mercury, and lead, in adipose (fat) tissue, bone, coordination bonds. Heavy metals are bound to albumin, enzymes, small peptides, cysteine, or methionine) or cloistered with gut microflora (Sears, 2013). Different inorganic compounds or molecules absorb energy at different wavelengths. The OligoScan compares this measurement to current references ranges, as identified in their report (OligoScan, 2017). Acute toxicity from heavy metals can be seen at lower body burdens than previously thought. Early lead exposure cause IQ decrements at a blood level below 2 micrograms per deciliter. The blood reference level for which the CDC in the USA recommends action and remediation of a child’s exposure is 5 micrograms per deciliter and chelation is recommended at levels at or above 45 micrograms per deciliter (Sears, 2013). Spectrophotometry is used in chemistry, pharmacy, environment, food-processing industry, biology, medical, clinical, material and chemical engineering and clinical applications plus other. In the clinical applications, spectrophotometry is used to examine blood or tissues for a clinical diagnosis.